Extreme weather events such as drought, torrential rains and floods are making life hard for the pastoral community in Kenya. This group is particularly vulnerable to the vagaries of climate change because of their low adaptability to unpredictable weather patterns. The latest Fifth Assessment Report of the global climate watchdog, the Intergovernmental Panel on Climate Change stated that temperatures in Africa, more so in the arid regions, are likely to rise more quickly than in other land areas. This, in turn, will amplify existing stress on water availability. 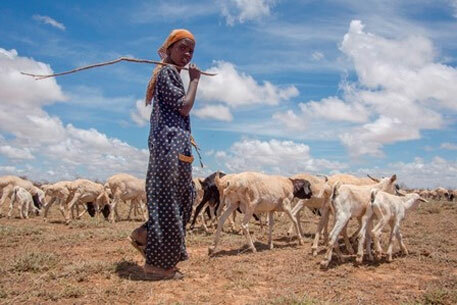 George Keya, assistant director for Range and Arid Lands Research (RALR), has been quoted by the news agency Inter Press Service (IPS) saying that if the expected short rains in October fail, Kenya’s pastoralists will face a “catastrophe”. According to Michael ole Tiampati, the national coordinator for the Pastoralist Development Network of Kenya, in the past the country used to witness droughts every 12 years. But due to climate change, drought occurs every two to three years now. This does not give the land sufficient time to recover from the aftermath. He added that pastoralists are no longer able to practice herd splitting to protect their herds from climate change. Herd splitting is where pastoralists divide their herds into groups and take them to different areas with less-severe weather changes. “With frequent and long-lasting dry spells, there is no place to shelter the herds,” he says. Statistics by RALR show that arid and semi-arid land accounts for 80 per cent of the total land in Kenya. Most pastoralists live in these areas and keep over 60 per cent of the country’s livestock population. Pastoralists have few livelihood options other than selling livestock. When the weather is favourable, they have good business prospect, selling up to 5,000 animals per week, reports IPS.“In a good season, an ox can go for as much as $1,000, a heifer for $560 while a camel can be sold for as much as $3,400, SeifHassan, a pastoralist from Garissa, tells the news agency. He sells his livestock at the Garissa market in northern Kenya. But extreme weather events pose a threat to the livestock. Diseases due to changing temperatures sometimes wipe out entire herds. Even if the diseases do not kill them, they die from changes in the weather pattern, Hassan told IPS. He talks about Peste des Petits Ruminants (PPR), a contagious disease that affects goat and sheep. “The disease can easily spread across borders and move from northern to southern Kenya and beyond,” he says. Another disease is the East Coast Fever, which infects cattle, sheep and goat and is caused by ticks. “This usually occurs during flood and is as dangerous as PPR. Such diseases add to the vulnerability of the pastoral community”, Keya adds. According to IPS, Kenya has prepared an economic blueprint—Vision 2030—to move from a low- to a middle-income country. “The plan lays out a strategy to establish livestock disease-free zones. But this is yet to be implemented,” Keya says. Tiampati believes the pastoralists need assistance in diversifying their livelihoods. He says that in some arid areas, such as in Laikipia in Rift Valley region, women are making good use of the aloe vera plant to make soap. Selling this is another mode of income for them.Keya, meanwhile, is happy that pastoralists in Rift Valley are making good use of the highlands and lowlands. “During the rainy seasons, pastoralists farm in highlands and keep their animals in lowlands. While in dry spells, they take the animals to the highlands to feed on fodder from the harvest as the lowlands recover,” he says.“Without such interventions, we are witnessing a catastrophe in the making,” he adds. Meanwhile, poor farmers in Kenya have joined hands to improve their disadvantageous position. Many find it difficult to cope with infrastructure development while grappling with climate change. According to a report by Reuters, farmers are pushing for a referendum, backed by some politicians, to review the country’s Constitution, which has been in force since August 2010. The aim of the vote is to make the national government more accountable for how development and climate change funding is allocated, the report says. The Constitution devolves power to the county level, enabling them to raise funds through their own levies, but the Central government still oversees how the money is spent. Farmers also argue that the Constitution is unclear about whose responsibility it is to manage community resources like land, water and forests. A Climate Change Authority Bill passed in 2012 was vetoed by the president. The bill sought to set up a body to seek funding for climate adaptation programmes at both national and community levels. It would also have had powers to seek legal redress for communities left out of development and environmental programmes. “The call for a referendum is because resources are not reaching marginalised Kenyans in various parts of the country,” Isaac Ruto, chairperson of the council of regional governors, which supports the referendum campaign, told Reuters. "Extreme weather events such as drought, torrential rains and floods are making life hard for the pastoral community in Kenya. This group is particularly vulnerable to the vagaries of climate change because of their low adaptability to unpredictable weather patterns." -- This means extreme weather is not unusual to Kenya. Pastoral community is adopting to these extremes for centuries. Extremes are part of natural variation in climate change. There is nothing new. However, the government must look into improving the conditions to pastoral community based on the past experience. "The latest Fifth Assessment Report of the global climate watchdog, the Intergovernmental Panel on Climate Change stated that temperatures in Africa, more so in the arid regions, are likely to rise more quickly than in other land areas. This, in turn, will amplify existing stress on water availability." -- IPCC is not a watchdog of global climate but a system to distribute billions of US$ on the name of global warming, a de-facto climate change. So far the global warming is less than 0.2 oC. This is insignificant when compared to changes in temperature in association with natural variation in precipitation -- temperature follows opposite pattern to precipitation. During drought years the temperature goes above the average and so also the evaporation and evapotranspiration.